I love Pyssla beads. We can make almost anything out of it! Now.. let’s see what else the kids did! Thanks for sharing. I believe my daughter loves this too. we really wanna try this art …. Do you have IKEA over in there? You can also order these beads from amazon.com. However they are not listed on the site as “Pyssla” beads, they are actually listed as “Perler” beads. They are the same thing. Hope that helps! hey. Yknow where to buy those rings so that th beads can stick on it? 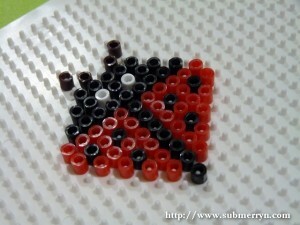 And do yknow what glue is better for th beads to stick on th ring? Thank you v.much. You can either get those beads from Ikea or Toys ‘r’ us and the mould you can get it from those two places too. We do not need glue for this activity. Just iron them after you are done arranging the beads and they’ll stick onto each other. Thanks . But if i wanna buy a ring base and stick my beads design on it, what kind of glue will you recommend? Thanks again! Is the tray you used to hold / arrange the beads included in the box of the pyssla beads? Or do i need to buy it separately? I could noot refrain from commenting. Exceptionally well written!